From hipster hangouts on the embankment to buildings with a distinctly cruise liner-esque quality, The Calvert Journal is taking you on a journey to discover St Petersburg’s nautical heritage and its starring role in reshaping the contemporary city. Beginning on enigmatic Kanonersky Island and finishing up with some well-earned drinks at maritime-inspired Machty, this adventure will take in history, creative spaces, a submarine and even a truly “shipshape” playground. It’s early. You’ve taken bus no. 70 from the landmark St Isaac’s cathedral to the end of the line and are standing at a roundabout on the shore of Kanonersky Island, in what feels like a forgotten corner of St Petersburg. Beginning the day with this feeling of slight bewilderment is key; here, looking out across the glistening water as it stretches to infinity, we get a sense of the city, founded by Peter the Great as a window to the west and born of the prospects promised by the sea. To one side tower the cranes of the Kanonersky shipyard, a monument to the industrial Soviet past and testament to a trade very much alive, while a vast grey ribbon curves around you, hanging above the island’s high-rises and paddling in the depths as it moves over the water. This bridge — the Western High-Speed Diameter — is making its journey past you to Vasilievsky Island, at once crossing and completely by-passing Kanonersky. As you walk towards the southern part of the island, the people and buildings become fewer, while bridges and cranes give way to the open sea. Relatively cut off from the city until a tunnel opened in 1983, Kanonersky is still not, strictly speaking, accessible on foot; as enormous cruise liners and plucky ferry boats edge away from the ports on Vasilievsky and gradually out of view, the power of the sea to connect, empower and isolate becomes all the more palpable. Bus no. 70 will carry you back towards the centre of town. Get off at Ploshchad Truda and walk the five minutes or so to the Central Naval Museum (Naberezhnaya Kryukova Kanala 2), perhaps stopping to pick up a coffee at PRIDE or a cheese and mushroom-filled breakfast blinchik from Teremok: taking in the naval history of the world’s largest nation is hungry work. Founded by Peter I at the start of the 18th century, the Central Naval Museum is among the oldest museums in St Petersburg. With over 800,000 artefacts, there’s no getting around the fact that this place is vast and more than worthy of a whole day’s exploration. First thing to do on a whistle-stop visit, before even getting stuck into any exhibitions: take a second to admire the surroundings. Having moved from the Old Stock Exchange Building in 2011, the museum has found its home in an elegantly repurposed, light-filled building opposite former shipyard New Holland. 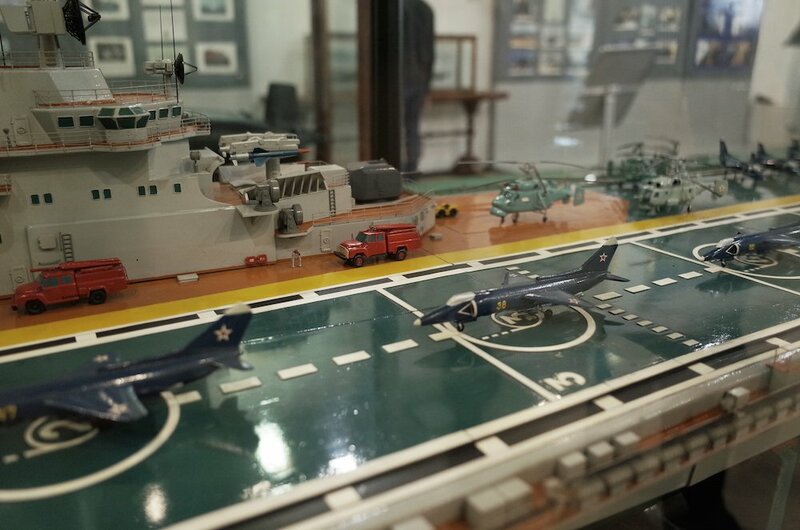 Inside you will find naval memorabilia, equipment, artworks and a mammoth collection of exceptionally intricate models. High on the list of things to see should be the Botik of Peter the Great: tiny boat, big impact. 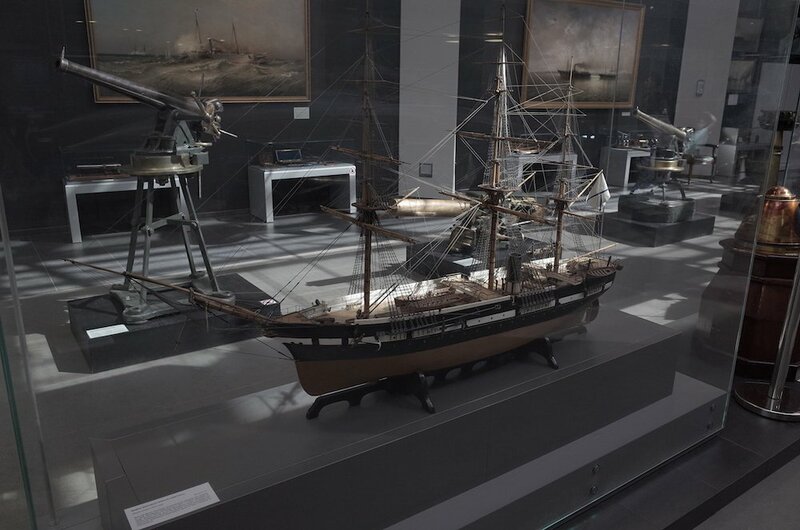 Peter discovered this miniature warship at the Royal Izmaylovo Estate in 1688 and learned to sail on it on waters near Moscow, and it has since become a powerful emblem of Peter’s desire to end Russia’s isolation and, indeed, of St Petersburg’s very existence. Our next stop is just steps away, on New Holland Island. Enter this historic and impressively triangular artificial island via the bridge over the Admiratelsky Canal. Created in 1719, this former shipyard has also housed a prison and top-secret naval and military facilities. After years lying abandoned, the island has been reborn as a vibrant public space, courtesy of a $475 million donation from Roman Abramovich’s Millhouse LLC. In 2016, New Holland opened to the public as a park and cultural hotspot, providing a welcome green space that recalls Moscow’s celebrated Gorky Park. Although development on the island will most likely continue until 2025, here you can already savour a break while lounging on the lawn, rent a frisbee or get competitive with a cut-throat game of petanque. Any younger visitors can enjoy an epic children’s playground designed to reflect the “Peter and Paul” warship. If your Teremok blinchik seems a happy memory from the distant past, head to the first floor of the distinctive round building named “the Bottle”. Here you will find an array of tantalising food options, showcasing the best of local gastronomic talent. Indulge at Ferma Burger, slurp Vietnamese soup at Pho’n’Roll, or enjoy a New York-style pastrami sandwich at Dikman’s Deli. Should today’s dose of maritime heritage already seem too much, you can find some alcohol-induced respite at New Holland’s very own ryumochnaya. While on the island, be sure to check out the numerous pavilions hosting contemporary artworks from Russia and around the world. 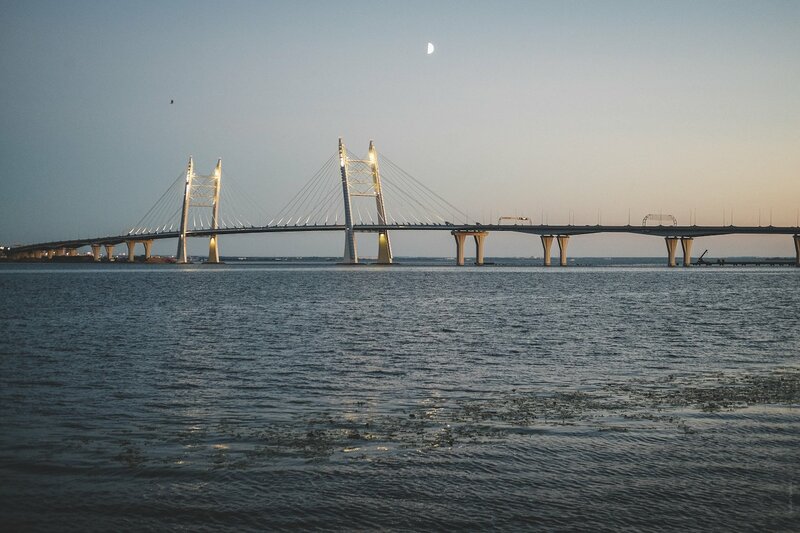 Take a leisurely stroll over Blagoveshchensky Bridge to reach Leytenanta Shmidta Embankment, a stretch of riverside on Vasilievsky Island with a bounty of maritime treasures. A walk southwards takes in a statue of Ivan Fedorovich Kruzenshtern, the Russian admiral who led the first Russian circumnavigation of the globe, while a couple of hundred metres further on sits Submarine C-189. Now above water, this submarine spent 35 years in the Soviet fleet and later sank in the harbour at Kronstadt, before seeing the light of day once again in 2005 thanks to local businessman and former submariner Andrey Artyushin, opening as a museum in 2010. Venturing inside the submarine — fully afloat and in no danger of sinking, we are reliably informed — you get a taste of the crew’s confined living quarters and a peek into the workings of the engine room and torpedo launchers, along with the chance to live out any spy movie fantasies with a look through the periscope. Now keep walking until you hit the big boat: the Krasin Icebreaker. Built in 1917, the ship — formerly named Svyatogor — was a pioneer of Arctic exploration and was frequently called upon to undertake treacherous rescue missions, along with being used for military convoys and later serving as a research ship. Now the museum is enjoying a leisurely semi-retirement as Russia’s only icebreaker museum commemorating the Arctic convoys. Now it’s time for some maritime architecture that seems to have run aground. From Krasin head straight up 22-aya Liniya Vasilyeyskogo Ostrova, perpendicular to the river, and find the SM Kirov Palace of Culture adjacent to the verdant Vasileostrovets Garden. The more eagle-eyed among you may have noticed that we are now some way from the river and in front of us is, in fact, a building firmly set on land. But who said boats belong on water? Not the Constructivists, that’s for sure. Parallels have often been drawn between Constructivist buildings and ships, a comparison invited not least by Swiss architect Le Corbusier’s famous 1923 appeal to his architectural peers to emulate the design of modern machines. Conceived by avant-garde architect Noi Trotsky, the imposing SM Kirov Palace of Culture (built 1931-1937) with its rounded tower, otherwise harsh angles and structure seemingly formed of uniform rectangular faces, is notable for its likeness to a freighter. Can’t get enough? 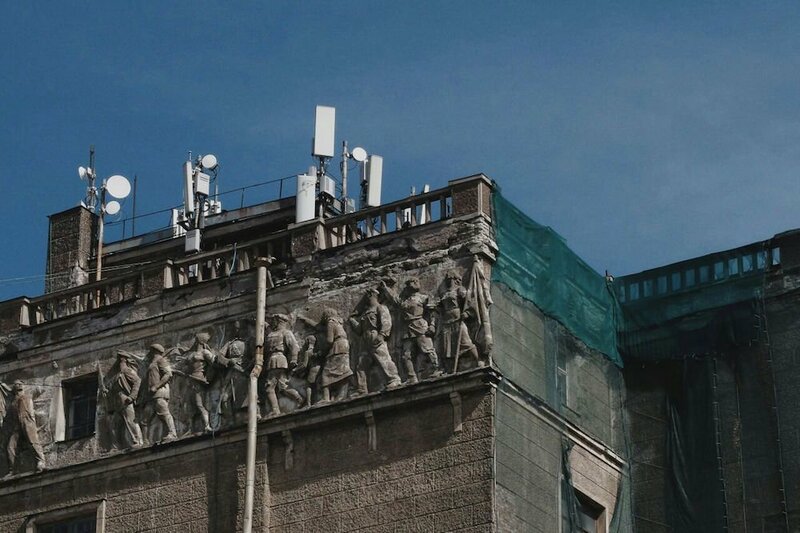 There’s more where that came from: check out more of Trotsky’s ship-like structures by paying a visit to the Kirovsky District Council Office and Kirov Meat-Packing Plant. Not just yet, though. First we head down Bolshoy Prospect to a waterside hipster paradise. 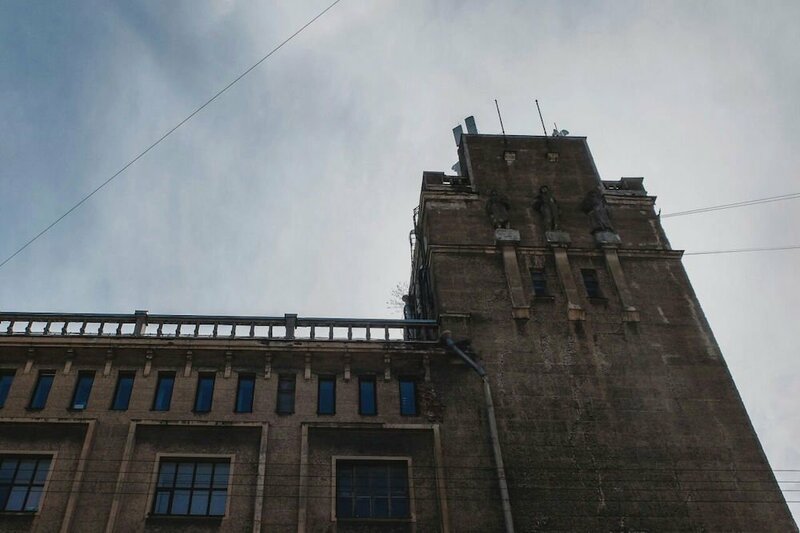 A former 19th-century factory, Sevkabel was brought to life and into the 21st century last year as one of St Petersburg’s most dynamic creative spaces and hangout spots. 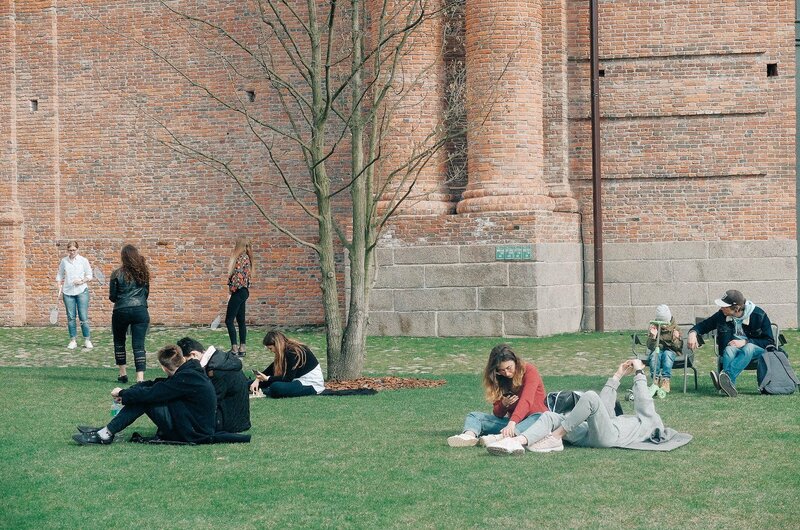 While the project is still in development, Sevkabel’s alleyways, courtyards and red-brick facades already host a stylish, ultra-modern embankment walk (worth a visit if only for the breathtaking view of the Gulf of Finland), a food court where you can devour some theme-appropriate fish and chips or decadent Belgian waffles, and an events space that has already become known for its legendary parties. The transformation of the harbourside area forms part of the revitalisation of the city’s Grey Belt, the mammoth industrial zone to the south of the city centre. Shortly on the way are an interactive science museum, seaview coworking spaces and an education centre, all set in an air of industrial urban chic. 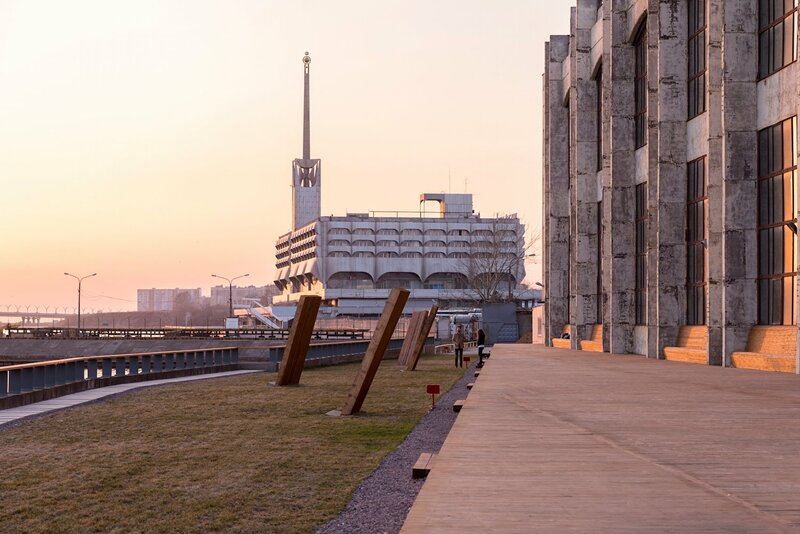 If time allows, combine a peruse around Sevkabel with a visit to the nearby Erarta Museum of Contemporary Art but, if the sun is already getting low, head around the ferry port and across the Shkiperskiy Canal for a much deserved drink at Machty (Masts). Set to re-open in early summer, this bar and club occupies an airy warehouse space in a former factory (classic) and hosts a range of concerts and parties, from techno DJs to film events. In terms of interior design, here you finish up your nautical day in style: a full-blown fishing boat is just a normal part of the decor here. Combined with a spectacular vista onto the Gulf of Finland, this delivers a curious sensation of being a passenger awaiting a journey, rather than a customer simply looking forward to a beer. In any case, you’ll soon get your sea legs with Machty’s wide selection of wine, beer and plenty of stronger stuff. All aboard!